Preface. 1. Blood Coagulation as a Part of the Haemostatic System (Maria C. E. van Dam-Mieras and Annemarie D. Muller). 2A. Nonenzymatic Cofactors: Factor V (Kenneth G. Mann et al.). 2B. Nonenzymatic Cofactors: Factor VIII (Philip J. Fay et al.). 3. Multicomponent Enzyme Complexes of Blood Coagulation (Guido Tans and Jan Rosing). 4. The Role of Vitamin K in the Post-Translational Modification of Proteins (Cees Vermeer). 5A. Initiation Mechanisms: the Contact Activation System in Plasma (Bonno N. Bouma and John H. Griffin). 5B. Initiation Mechanisms: Activation Induced by Thromboplastin (Bjarne Østerud). 6. Platelets and Coagulation (Robert F. A. Zwaal et al.). 7. Fibrinogen, Fibrin, and Factor XIII (Agnes Henschen and Jan McDonagh). 8. Fibrinolysis and Thrombolysis (Désiré Collen and H. Roger Lijnen). 9A. Inhibitors: Antithrombin III and Heparin (Michael J. Griffith). 9B. Inhibitors: Protein C (Björn Dahlbäck et al.). 10. Interplay Between Medicine and Biochemistry (H. Coenraad Hemker). Subject Index. 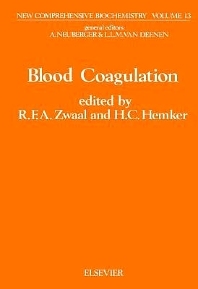 This is the first book to give complete insight into the biochemistry of blood coagulation, and demonstrates how this field provides important contributions to fundamental biochemistry, such as enzyme kinetics, lipid-protein interactions, oxidative carboxylation, and cell receptors. The book will be of interest both to biochemists and molecular biologists who want to gain insight into the process of blood coagulation, as well as to those already working in the field of blood coagulation who desire to broaden their insight into its molecular aspects.